I am always on the prowl for some tasty and healthy recipes. I love cooking, not just because a home-cooked meal beats take-out, but also because I like knowing exactly what I'm putting in my body. While I try to remain healthy most of the time, I can't help those cravings for classic American cuisine. Thanks to SHAPE.com, I can still indulge in one of my favorite dishes in a healthy way. Chicken fingers, anyone? Don't fear, instead of frying the chicken strips, they are baked. Also, instead of dipping them in fat-filled Ranch, they are served up with mango ketchup. Yum. What makes this tasty dish even better is that it was thought up by Alexander Schnopp, chef of the Boulders Resort right here in Arizona. Preheat oven to 375°F. Lightly spray a cookie sheet with cooking spray and set aside. Mix bread crumbs, cereal, brown sugar, salt, pepper, and curry (if using) in a large mixing bowl or casserole dish. Drizzle oil evenly over the breading, then mix in. Arrange three shallow containers, one with the flour, one with the beaten eggs, and one with the bread crumb mixture. Individually dip chicken tenders into flour, then eggs (letting excess run off), then breading mixture. Arrange breaded chicken pieces on the cookie sheet. Bake in the oven for 15 minutes, or until crisp and brown all over.Serve with mango ketchup (recipe below). Heat oil over medium heat in a medium saucepan. Add onion and cook, stirring, about 7 minutes, or until translucent but not browning. Add mango, orange juice, and nectar or honey to pan. Season with salt and pepper. Cook over medium heat, stirring occasionally, about 5 minutes more, or until thickened. Remove from heat and stir in vinegar and lime juice, adding more to taste, if desired. 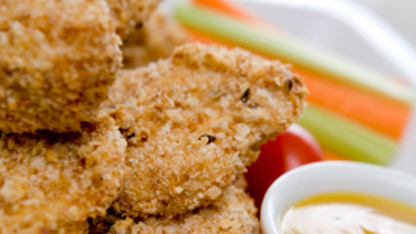 Serve alongside chicken fingers warm or at room temperature. This recipe serves 6, at only 223 calories per serving. Talk about guilt free!